Bergen was the third (but not final) stop on our whirlwind travelling month in April. This trip was a bit of an impulse buy as I got a call from Alex at work a couple of weeks earlier saying flights to Bergen, ‘this cute little fishing village in Norway’ were really cheap on of our free weekends and would I like to go? After a quick google image search, I decided that it indeed looked pretty cute, so we locked it in. Once I looked into this cute little fishing village a bit further, I realised that Alex may have been a little wrong about his initial assessment of Bergen. It turned out to be the second largest city in Norway. This explains why there are so many flights going there from London. To be fair, the only thing you see when you google this city is either pictures of the Fjords or of the UNESCO world heritage site Bryggen, the Old Wharf, so it does look quite quaint. Bergen is known as the ‘Gateway to the Fjords’ so a boat tour was high on my to-do list. Alex pre-booked us a 3.5 hour tour for early on Saturday morning. The tour that we were on ended up being really informative and entertaining. Throughout the trip, the captain would talk to you about the different areas that you were passing and how they were significant to the area. Towards half way, the crew asked for volunteers to don wet-weather gear in order to gather some fresh water from the waterfall for everyone on the boat to try. Being half icicle already, I politely declined, but Alex was keen so he got dressed up. The boat pulled alongside the waterfall, and the guys had to hang over the side with a bucket to collect the water. When they thought they had escaped the worst of the waterfall splashes, and managed to successfully collect a full bucket of water for the boat, they all turned back around and got a huge bucket of icy fjord water dumped over them. I personally found it very hilarious, Alex not so much. I think after that, his coldness was on par with mine, so when we arrived back to Bergen, we had to go straight back to the hotel for him to have a hot shower to warm up. For lunch we ended up going to the famous fish market. As you would find in any Scandinavian country, the prices were hefty, but we decided we could not leave Norway without having some seafood. The selection of strange seafood here was quite impressive. While wandering around trying to decide what to have for lunch, Alex noticed that you could order a whale burger. He is one for always trying different and strange foods, but this is one meal that I could not bear the thought of being eaten in front of me, so after some negotiation, we settled for grilled fish, prawns and calamari. It was really nice to eat seafood again as we do not eat much of it in London, but I would have to say that there was nothing particularly special about this meal, especially given the price. We decided to make the most of the sunshine by taking the cable car up the mountain in the city centre and soaking up the beautiful views atop Fløyen. Once you are at the top, you get amazing panoramic views across the city and out to the Fjords. It was quite something. While we were up the mountain, we saw someone with a drone for holiday photography for the first time. I feel this may be the replacement for the selfie stick as you can take much more extreme photos of yourself for your travel album, and do not have to have the stick, or a long arm in the foreground. We took the long way down the mountain which wound through absolutely stunning woodlands with bubbling creeks, moss covering the rocks and rays of sunlight. 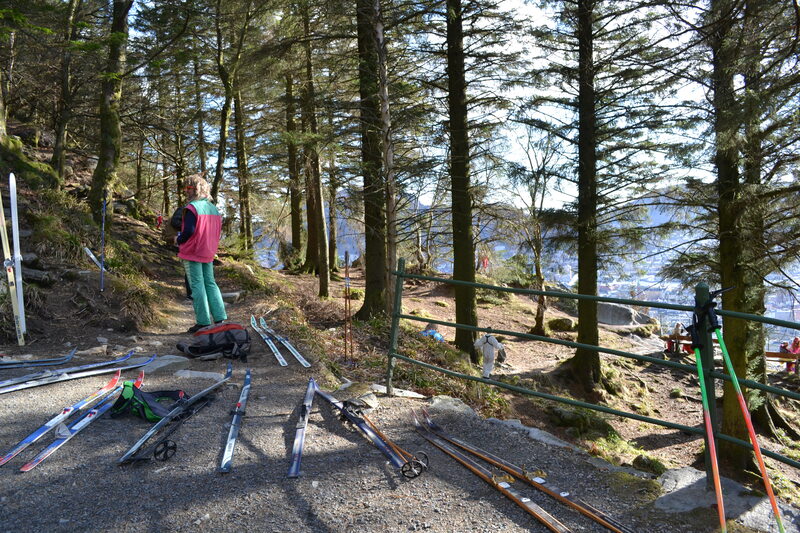 The tranquility was soon disturbed by a large group of skiers, sliding down the rough, rocky path on retro skis. It was one of the most hilarious, out of place things we have seen. I think they must of been on some strange Norwegian version of a pub crawl as they kept stopping on their way down the trail to sing songs and down some pints. Fantastic. After our splurge on lunch, our requirement for dinner was something cheap. We have since discovered that this does not exist in Norway. What we ended up getting for dinner was some burgers from a bustling little burger bar called Royal. This place was packed when we got there and for good reason, the food was fantastic. Alex wanted to try some local beer with dinner so I asked the bartender what he recommended. Turns out they started selling a new local brew that day and the guy who had brewed it was standing right beside me, so after the sales pitch, there was no way I could turn down someones beer to their face (even though it sounded like something I really wouldn’t like – a strong amber ale) so ordered two. It was not bad, actually. One mistake we made was organising to do all of the touristy activities on Saturday to leave Sunday free to mooch around the city. As is common in many European cities, Sunday is a day of rest, and nothing is open. I was quite disappointed by this, as I was planning on looking around all of the cute homewares shops. We basically had nothing to do for the day except for stroll around the city, visit Bryggen (the old Wharf where the wooden buildings date back to around the 1700’s, very cute), look at the parks, harbour, have a nice long lunch etc. I think if I were to go and do it again, I would reverse the days so that we had a little more to do on the Sunday. It was still nice to chill, none the less. We will definatley be returning to Norway. This country was so stunning, clean, and different to London. A number of our friends have recently done kayaking/hiking tours through the fjords and have raved about them, so that has been added to the must-do list for next year.